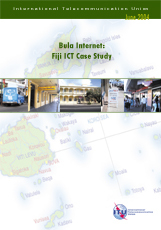 Fiiji, a Small Island Developing State (SIDS), is at a crossroads in its ICT evolution. The country's relative position in telecommunication penetration rankings has been declining over the last 30 years and to catch up, it needs to fully exploit the advantages it has. This include its strategic location in the Pacific and the fact that it headquarters of a number of regional organizations. Another strength is its English-speaking, literate population and the presence of the University of the South Pacific, a major regional tertiary educational institution. The decision to connect to the Southern Cross fibre optic undersea cable was forward looking and ensures the country an ample supply of bandwidth. It now needs the applications, services and growing market to exploit this. Major barriers to becoming an information society are the lack of awareness about the benefits of ICTs to meet development needs, limited infrastructure, especially in rural areas, and the country's long-term telecommunication monopoly. The fact that there are different operators for each telecommunication segment (local, mobile, international and Internet) adds to higher pricing. With this market situation Fiji is missing the benefits that a more competitive telecom market would provide such as lower prices, better quality, enhanced innovation and greater customer focus. Fiji's mobile peak time call charges, for example, are among the highest in the world and given the current levels of coverage and tariffs mobile penetration (at around eleven percent) is probably close to saturation. Market liberalization and sector reform are crucial. A new telecommunication bill, calling for the establishment of a telecommunication regulator and a licensing framework, are under preparation. A mission to Fiji was carried out from June 26 - 2 July 2003, involving Michael Minges and Vanessa Gray. The mission and interviews were coordinated with the Ministry of Communications (MoC).